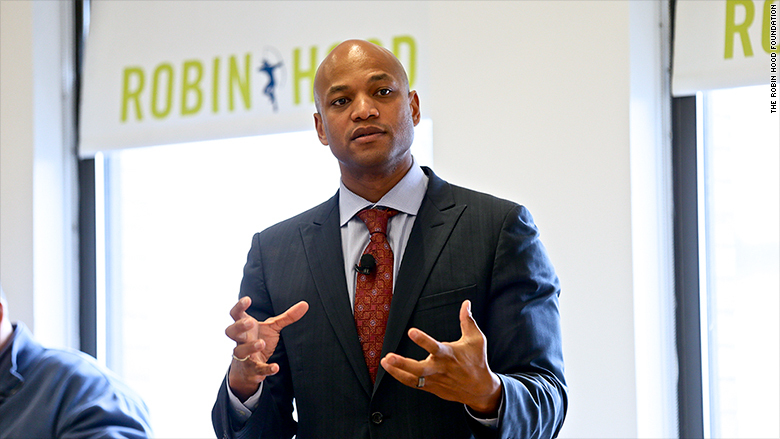 In his quest to eradicate poverty, Wes Moore is declaring war. "We need to create a battle plan for poverty," says Moore, the recently appointed CEO of New York-based nonprofit Robin Hood foundation. "We have people who are living in a state of chaos, and for many of them, it's to no fault of their own. This is what they were born into. This is what they're being raised in," Moore says in a new podcast episode of CNN's "Boss Files with Poppy Harlow." There are 40 million people living in poverty in the U.S. today, according to the most recent data from the Census Bureau. That's down from just a few years ago, when the poverty rate was 48 million in 2014. But still, more than half of those currently in poverty are children, senior citizens or disability recipients, according to an analysis by the Hamilton Project at Brookings. Moore's plan is twofold: Continue to fund programs that make a social impact and to steer the conversation around public policies aimed at reducing hunger, providing educational opportunities for low-income kids and criminal justice reform. "We have a situation in our society right now where it's far too easy for people to fall into poverty, and it's far too complicated to be able to get them out," Moore says. "Oftentimes, if you're born poor, you'll die that way, too." A veteran of the war in Afghanistan, Moore says the battle he is fighting now is one that has persisted since President Lyndon B. Johnson first declared the War on Poverty in the 1960's. This time, though, Moore says Washington isn't helping much. He says both political parties are failing Americans who are struggling to get by. "I think that we have watched neglect on both sides of this issue," he says. "I can't do my job, we can't do our job, if we constantly have to push against bad policies that are keeping people and putting people in a greater state of poverty." Moore is working to change that narrative. To date, Robin Hood has raised more than $2.5 billion. The funds help support educational programs for low-income children, poverty research and early stage companies helping low-income Americans. But Moore recognizes that philanthropy alone is not enough. 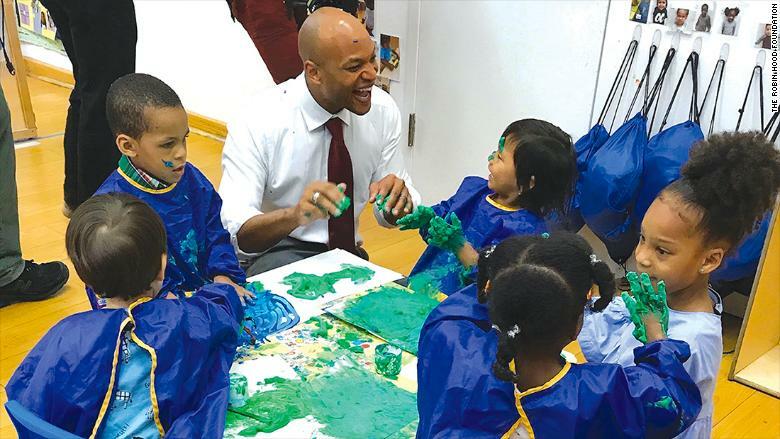 He's on a mission to revise policies -- making sure families don't go hungry, ensuring access to quality education that is not defined by the zip code a child lives in and reforming the criminal justice system. 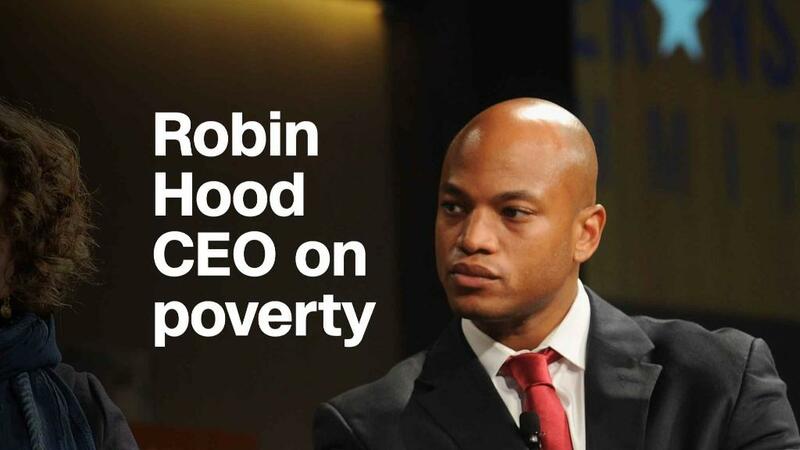 To help, Robin Hood plans to hire a Chief Public Policy Officer to inform policy makers and offer commentary for discussions centered on poverty, the foundation's spokeswoman said. For Moore, this mission is personal. The 39-year-old grew up on the brink of poverty in Baltimore and later in the Bronx during the 1980s and 1990s. His father died unexpectedly from a virus that Moore believes was preventable. He says the social injustice his father faced contributed to -- if not led to -- his death. "When he first went to the hospital, there was an assumption that he didn't have health insurance because of how he was dressed, because of what he looked like," Moore tells Harlow. "I think one of the reasons that I'm so passionate about this work and this issue is because I think for far too many people, that hasn't changed, where we can make very quick and glib assumptions about people that have real life human consequences." Left to raise her children on her own, Moore's mother worked three jobs to send him to a private school in New York City. While Moore admits he didn't really fit in, he learned how to be a "chameleon." "I very quickly would find myself leaving my neighborhood, which was completely and intentionally neglected for decades, then going across town to this school that was a wonderful, beautiful school," Moore says. Moore later attended military school for high school and junior college. "I would say the things that happened there saved me," he tells Harlow. "I found a passion for leadership, and I found a passion for doing something and being in a place where you know your belonging actually matters." Moore reflects on this in his book, "The Other Wes Moore." In it, he writes about two boys with the same name who are from similar circumstances, but took different paths. One is a Johns Hopkins University graduate, a military officer, and a Rhodes Scholar like the real Moore. The other is serving a life sentence in a maximum-security prison for murder. "I think that I'd be naïve to say that luck didn't play a part in it, and I think there's an inherent problem in that because luck shouldn't be the thing that we're relying on," Moore says. In his mission to create opportunities for the less fortunate, Moore acknowledges government must help -- and he doesn't rule out a run for public office sometime in the future himself. "I'd be lying if I said that I don't think about it," Moore admits. "I think all of us kind of think about where's the place that we could put the best use and put the best impact to really make sure we're creating concrete and substantial differences." Correction: An earlier version of this article incorrectly stated the date of the War on Poverty.